The Earth Temple scarred me as a child. There just isn’t a better way to put it. This miserable mausoleum was leaps and miles and worlds away from what I’d encountered throughout the rest of my journey across the open sea. I began with a furtive crawl, more so than in any other dungeon that I would be eager to sprint through and marvel at with glee. 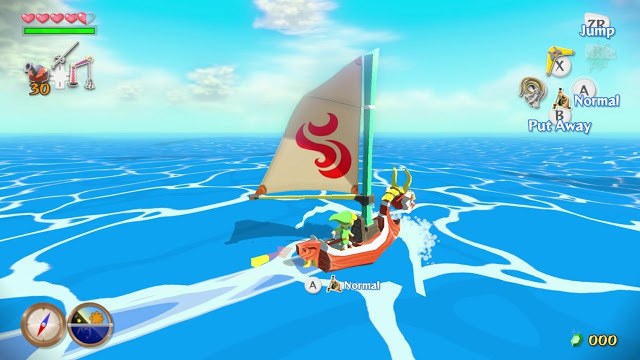 Here the dynamic colors and life I’d seen throughout The Wind Waker were stripped away, a washed out ghost of the world I’d come to know, only the cartoonish twangs of didgeridoos reminded me of where I was. 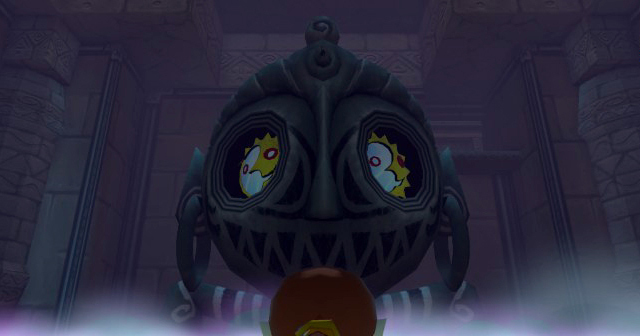 I found something a little unsettling in how solemn Medli, my Rito companion, appeared throughout the dungeon. Throwing her into a wall removed this entirely, comical stars dancing above her spinning eyes, but it wasn’t enough to settle me. She was essential to get through the dungeon, but the sudden responsibility of looking after her was also daunting. How was I even going to fend for myself in this deep, joyless cavern? 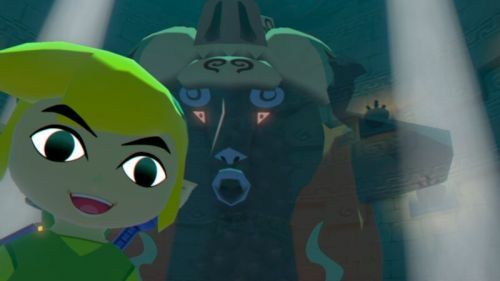 Skulls and thorns and disjointed, shrieking appendages that lurch and cling onto Link’s skull; the unholy host of nightmarish ghouls dwelling in its depths worsened as the pair of us scuttled through. Chuchus, normally comical slash-fodder, were now immortal and persistent in their squelching, viscous creep. Beyond the grinning, giant statue atop a pool of cursed fog, I reached a new room; my Tingle Tuner informing me of a new enemy, Poes. I was not ready for this. I hadn’t even seen them, but my child self just knew he wanted out. So I left. I left Medli there and wouldn’t return to the dungeon for years to come. To this day, I’m really not sure what it was, because for all accounts I’d seen and played much worse at that age. I’d even already encountered the Redeads below the Private Oasis, which to me was an ominous precursor of what was to come. It horrified me entirely. Below a bright hut with a tile-puzzle minigame, I met hunched, tribal looking corpses, their heads elongated to uncanny proportions, their hollow eyes boring into me as they shuffled forward screaming. I soon defeated the undead twins, but they didn’t disappear. I was certain they’d grab me if I dared approach them. 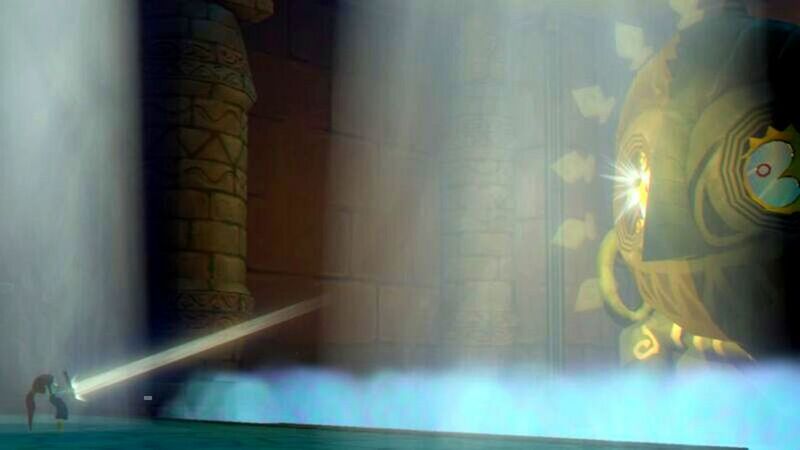 The uncomfortable amount of time Wind Waker Redeads stay down always got to me, as if they were only pretending to be defeated, to grab you later. It was a moment of pure horror in my childhood, a kind of terror so disjointed from the rest of the game’s aesthetic, but only possible through its expressive style. It’s this disjointed feeling the Earth Temple has, deep underground, away from the Sun’s touch that sets it apart for me. The entire place was something I wanted to forget. So I travelled. I collected Triforce pieces, lived on Windfall Island, entered auctions, planted flowers, and completely ignored my duty. I didn’t care, I was never going back. I did every side-quest I could, visited every tile on the map, played other games. And years later I returned, more out of frustration than anything. It was a game I loved, and I wasn’t going to be spooked by it any longer. 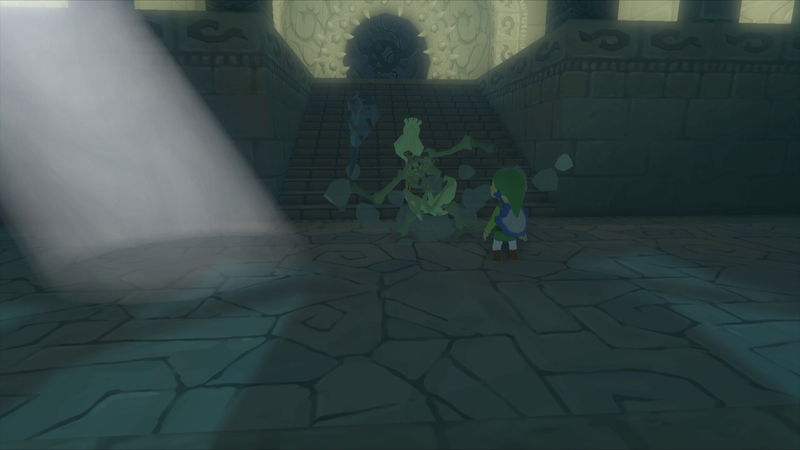 Through its haunted halls I carried Medli. We sprinted to where we left off and in a blind fit of desperation hacked at the Moblins, knocked the floating lanterns out of the air… only to have the most adorable specters cackle and leap into Link’s head. This was what scared me off? I fought the big-boned bruisers of the Earth Temple for the Mirror shield, the Stalfos were nothing but slow and comical. It was the game I remembered again. We sprinted through halls of cascading coffin lids, I ran at every Redead with clumsy vigour; I was finishing this dungeon. I ignored all unnecessary rooms and ran to the Boss’ lair. Now, as I’d spent more time in this dungeon than any other, at times visiting its rooms just to see if I could venture further, I pieced together in my head what the boss might have been. I saw horned Bubbles on curtains, making a connection between enemies in previous dungeons and their Boss. I imagined it was either that or some kind of even more monstrous Redead. I was ready, no matter what was behind the thorn-crowned doors. It was going down. A comical, colorful dance party of ghosts in spanx that formed a fat, jiggling, fire-breathing Poe. The Boss was a lot of fun, easy actually, moreso than previous bosses and is actually my favorite from the game. The Master Sword was partially awakened and I moved on. It felt strange to be held back for years by a game with such friendly visuals. Even stranger, from this point on, all monsters that went bump in the night, all ghouls and dark creatures in Zelda became my favorites. The Poes from which I fled I championed and are still my favorite foes today, any undead part of a new Zelda game I looked forward to. My love for the creepiness and horror of Zelda that so rarely emerges all stemmed from the cutest game in the series. 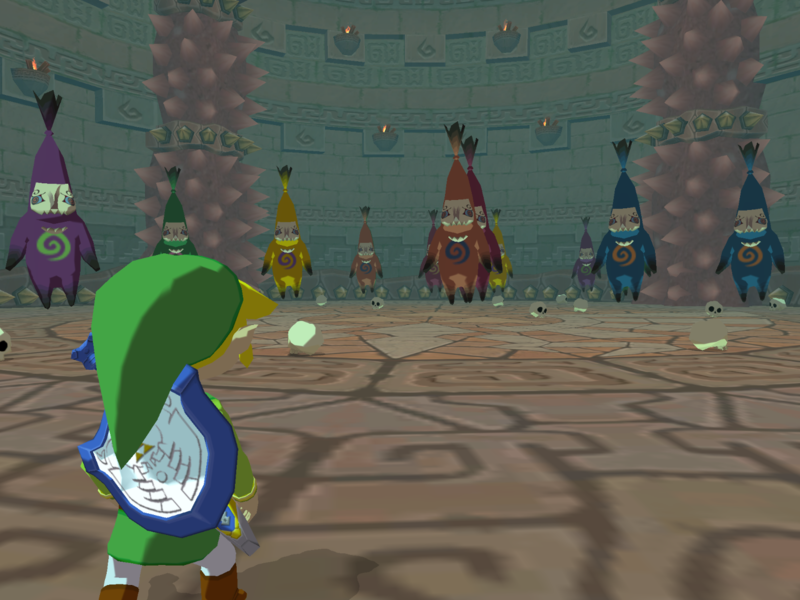 There are worse dungeons, darker tones and creepier foes in other games, but the visual dissonance of the Earth Temple from the world above really stayed with me and ultimately crystallised my love for the series, the characters, and yes, the iconic foes of Zelda as a whole.